That's how I've been brought up to think about Colorado Potato Beetles. I've been trying to find an online example of the 'wanted' posters that used to be in British police stations, warning the public about being vigilant and reporting any sightings of the creature to the authorities. I haven't had much luck: this being the closest I could get. The site says the image is from The National Archives, but I couldn't find any trace of it in the Catalogue or in their image library. 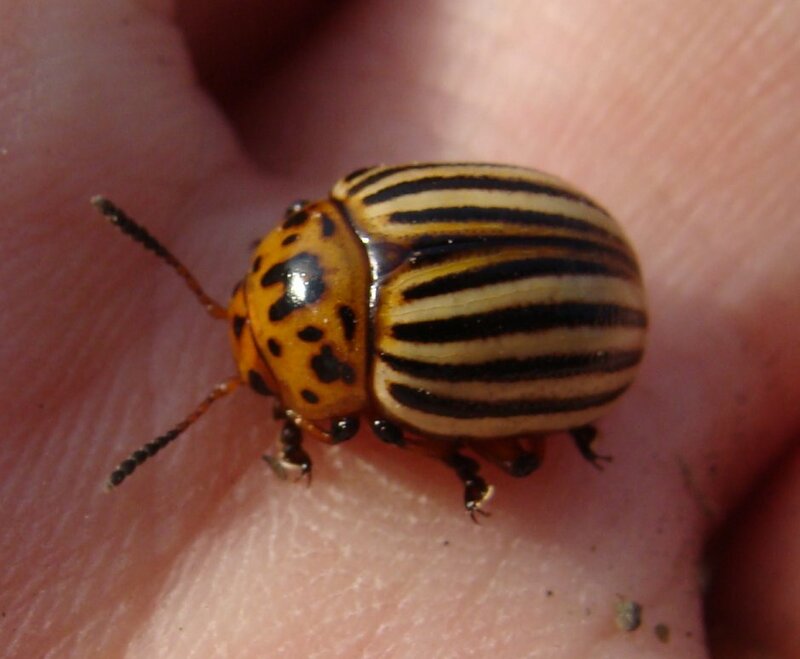 The latter isn't searchable and is divided up into a number of categories, none of which suggested 'Colorado Potato Beetle' to me. But this post isn't supposed to be a rant about usability of archives' websites, so I won't go on about that (however tempting it may be). In spite of their 'most wanted' status, they aren't any sort of a threat to humans or at all difficult to catch. They don't move very quickly and their hard shells make them easy to pick off the plants (unlike the tomato hornworms, which are all wriggly and revolting). I keep an eye on the potatoes, but have only found four of these beetles so far this year. When I find them, I feed them to the chickens, who think they are a great treat. The rooster picks them up, one at a time, then makes excited 'look what I've got for you' noises and presents them to the hens. Seems a better way of dealing with the problem than spraying the crop with anything. Potato beetle is the only reason I don’t grow potatoes anymore. They can be a huge problem if there are hundreds of them. They can eat the whole plant in one day. I have read that ducks will eat them right of the potato leaves, without harming the plant. I don’t have any ducks unfortunately. I hope you don’t get more of them.